This brief article is to explain the use of the standard filter and the effect they have on monochromatic images. Colored filters were used with B&W film to will lighten similar colors on the color wheel and darken opposite colors. As an example a red filter will darken the opposite primary colors, green and blue while but will have the most effect on Cyan which is a combination of blue and green. Conversely, it will lighten red and colors that contain elements of red like orange and magenta. The Red filter has the most dramatic effects. It creates high contrast in monochromatic scenes. It is one of the most used filters for landscape photography and where a high level of creativity is expressed. The orange filter is used to lighten reds in an image. It is an excellent filter as for black and white portraiture. The filter will reduce the appearance of skin blemishes and redness in the eyes. The yellow is a filter that has the least effect and used mainly to make blue skies a shade darker. 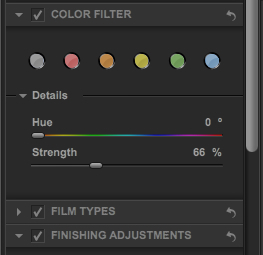 It is probably the most used in B&W film photography and least used of all the colored filters in digital photography. The Green filter is similar to the Yellow and not heavily relied on. It is used in landscape photography as it does favor the deepening of reds and oranges and ideally suited for fall foliage landscape photography. There is a slight drawback as it will lighten the blue in the skies and reduce contrast. The Blue filter has traditionally been least used in monochrome photography. It was used to reduce overall contrast. Note: The NiK Silver Efex color filters will only work if your image is in color and contains RGB information, An image already converted to B&W or brought into NiK as a B&W will not be impacted with these filters.